Looking for a gift for friends or family? 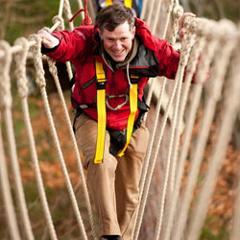 Then why not purchase a TreeZone Aerial Adventure course gift voucher for them? An off-road adventure using space-age technology on the wonderful Rothiemurchus Estate, near Aviemore in the Cairngorms National Park. If you're looking for ideas for a birthday or Christmas present or just a surprise for a family member or friend, why not buy one of our activity gift vouchers to redeem against an In Your Element activity or canoe/ kayak hire bookings.